Ireland twinkles like a green jewel—it is truly an Emerald Isle! I went there right out of college to explore my roots. And I had to hold my breathe looking out at the beauty of that landscape. I also couldn’t help but love the leprechaun-like character of the people. In Ireland, every chance meeting is an opportunity to share a grand story! So, as someone of Irish ancestry, this is my story and I’m sticking to it! St. Patrick died on March 17 sometime during the 5th century. Yet death is not a fear-ridden topic for true believers. Ever since that time Patrick’s gem-quality life has been shared to lift souls above the humdrum! As a lad Patrick was taken captive from his home in Britain and forced into slavery on the Emerald Isle. During his time as a pig herder, the boy meditated on the quiet hillsides. He began to experience the presence of God. During a vision, Patrick was shown how to escape and told to return to England. There he became a priest and then a bishop. Throughout his education, the young man felt a longing to return to the Emerald Isle that held the key to his original conversion. When he landed on the shores of County Leinster, a chieftain challenged the man in robes. He told Patrick to bow before the pagan Druids or be killed. Instead, the new bishop held up his hand, and the chieftain couldn’t move until he became the one begging to learn about the religion of Jesus Christ! Patrick traveled around Ireland for 40 years and made thousands of converts. He healed the sick and helped the poor, until he had instilled a deep faith that seems to permeate the very hills of the land. Ancient stories say that Patrick drove the snakes out of Ireland. This was actually a metaphor for driving out the worship of idols. In Ireland, Patrick is a figure considered to be comparable to Moses who could wield his staff to call attention to the Lord’s power! 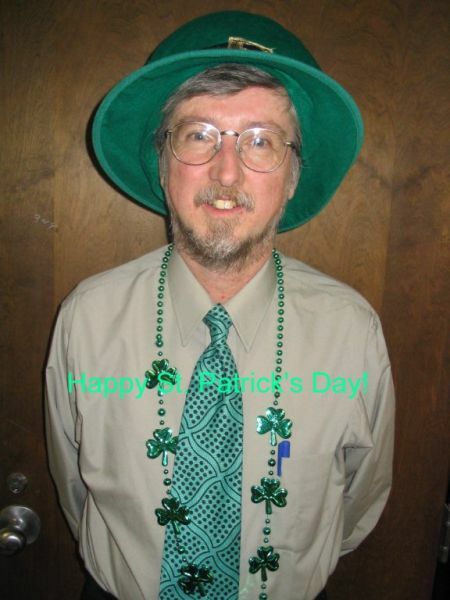 To teach the pagans about the Trinity, Patrick held up the common plant of the land…the shamrock. The three parts of the plant indicate the unity of Father, Son and Holy Spirit. When the Irish find a four-leaf clover they say the fourth leaf is the spirit of “Paddy” now looking down from heaven to help us out here! When my ancestors were among the thousands who fled the island during the Potato Famine, at the beginning of the twentieth century, they brought with them their love for the slave who became the bishop. Patrick was the name given to my oldest brother who will soon be wearing a huge green hat while teaching Numbers Theory on March 17. –Judith Costello. Judith is the mother of two kids. She and her family live on a small farm they call “Sagging Acres” in rural New Mexico. Judith writes for national and regional magazines. She is a catechist, artist and a Secular Carmelite (OCDS).